• Zinc matrix of Zinc Arginate Chelate, Zinc Citrate and Zinc Monomethionine. Performix™ Super Male T contains a unique combination of Furosap® and PrimaVie®. Furosap® is made with patented technology to help naturally support healthy testosterone levels. ** Uses a novel and patented process for the extraction of bioactive, high-purity furostanolic saponins, particularly protodioscin from Fenugreek. Zinc is a trace mineral required for numerous aspects of cellular functions, including protein synthesis as well as men's performance. ** Included in Super Male T is ZX3™ - a synergistic matrix of Zinc Arginate Chelate, Zinc Citrate and Zinc Monomethionine. 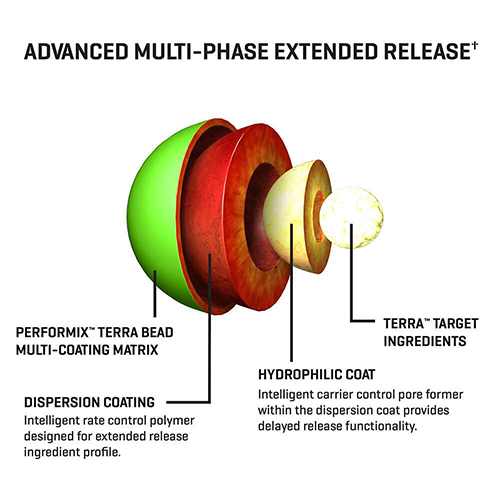 We’ve created a delivery system that supplies these ingredients via multiple targeted release points through TERRA Intelligent Dosing™ technology. Supplement your workout with Performix™ Super Male T.
78 capsules. 26 servings per container. Every Performix™ supplement is driven by our TERRA Intelligent Dosing™ technology, utilizing best in class bioavailability enhancers and intelligent delivery to help maximize every single molecule's potential... period. ** To out perform, out last and out do. Directions: As a dietary supplement, adults take 1 serving (3 capsules) 30-60 minutes before bedtime with 8 ounces of water. For best results, avoid taking with dairy or other calcium-containing foods or supplements. Do not exceed one serving per day. Please read entire label before use. Other Ingredients: Sugar, Mannitol, Gelatin, Corn Starch, Polyvinylpyrrolidone, Silicon Dioxide, Titanium Dioxide, Pharmaceutical Glaze, FD&C Yellow #5 Lake, FD&C Red #40. Warning: THIS PRODUCT IS ONLY INTENDED TO BE CONSUMED BY HEALTHY ADULTS, 18 YEARS OF AGE OR OLDER. Consult with your physician before using this product. Discontinue use and consult a health care professional if you experience any adverse reaction to this product. Discontinue use two weeks prior to surgery. DO NOT USE IF SAFETY SEAL UNDER CAP IS BROKEN. KEEP OUT OF REACH OF CHILDREN. Store in a cool, dry place.